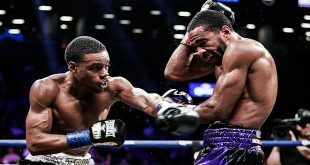 There were late July fireworks in Las Vegas last night, with light welterweight Terence Crawford outboxing divisional rival Viktor Postol in front of seven thousand fans at the fabled MGM Grand in a world title unification contest. WBC titlist Postol wasted no time in going after WBO champ Crawford from the first bell, pressuring the shorter man and enjoying some success. Crawford was content to study Postol's strategy in the first couple of rounds until the switch-hitting Nebraska man picked up his rival's timing and began dismantling "The Iceman". Postol towered over Crawford but the lanky Ukrainian's advantages of height and reach were turned against him by his very quick and shifty adversary. 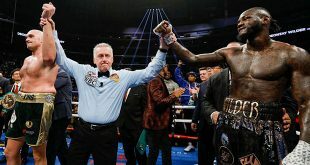 By the fourth round, it was clear that Crawford had the measure of Postol, zipping in single shots and combinations while retaining perfect balance as Postol was made to look clumsy and awkward during countless exchanges. The fifth frame was disastrous for Postol as he was dropped twice. The first knockdown looked to be due to a tangle of legs but the second came after a wide-open Postol was tagged with a hard counter shot and reeled into the ropes. From that point on it was all Crawford as Postol started looking for one big shot in order to turn the fight around, a shot that never came. Round after round Crawford rained leather upon Postol, nailing the Los Angeles resident with all manner of shots from an uncharacteristically southpaw-only stance that the WBC kingpin had very few answers for. The championship rounds saw Postol put in a major effort but Crawford was just too fast and too skilled. Postol dug himself an even deeper hole after he lost a point for rabbit punching in the 11th. The 12th and final round was entertaining as both combatants went to war, with Crawford once again proving to be the better boxer. Adding the WBC belt to go along with his WBO strap, Crawford, 29-0 (20), swept all three cards by wide scores: 118-107, 118-107, 119-108, remaining undefeated while Postol, 28-1 (12), suffers his first professional loss. There are reports suggesting that Crawford will face Manny Pacquiao later this year but it's not clear at which weight class the pairing will take place. On the undercard there was another battle of undefeated boxers with Mexico's Oscar Valdez, 20-0 (18), hammering Argentina's Matias Rueda, 26-1 (23). 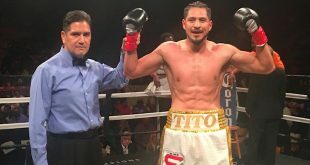 Valdez imposed his will immediately, beating Rueda to the punch in nearly every exchange. By the second round, Rueda was having difficulty, going down twice before the bout was waved off at 2:18. With the win, Valdez captures the vacant WBO featherweight title and given his genuine skill and punching power, is likely to hold onto the belt for awhile yet.